A few years back we returned home from a week of skiing to find spring unfolded all over our city. It’s amazing what time will do to the hope held underneath the hard, dark cold of winter. And while it feels almost disrespectful to regress into snow and ice, beauty is sometimes born from the deadest of seasons. And from the darkness. The final day of our trip was spent with an old friend who stood beside us as we spoke our vows of forever at the altar. Years later, he holds season passes at a mountain, so it was a natural place to meet. But what I saw was anything but “natural”. At least by my own, limited definition. Throughout the day, I watched blind skiers conquer run after run. Paired with volunteer guides, they made their way to “safety” through the paths of challenge. And determination… and exhilaration… and, well, trust. 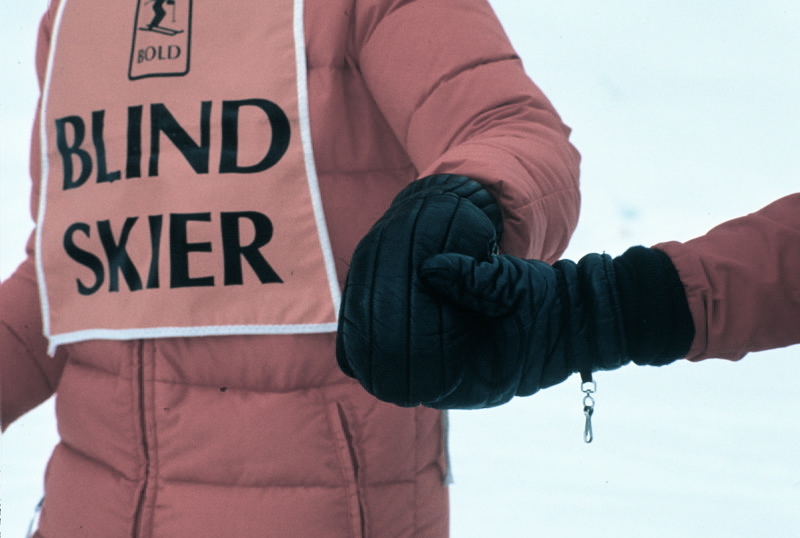 I saw grown women and men donned in neon “BLIND SKIER” vests. I saw a little girl with braids, my daughter’s age, wearing that same vest. They were skiing better than me, holding heaps of more trust that I ever could. As I clutched my poles to ease the fear of steeper runs, blind people were tackling moguls. Seriously. It was good, for sure. But was it safe? Not really. We crave novels and plays and movies with drama. We yearn for a plot rich in meaning, for without tension, the story’s not worth our time. We reserve the right to close a book or walk out on a movie when we can bear the boring no more. But in real life, we hate it. We hate the drama twisting with unpredictability as it wrings our very hearts. We scorn the uncertainty of what we can not see, and we’re ashamed of what we can’t control. The Master Playwright, He woos the drama out of us, inviting us to paint stokes on His grand canvas like blind skiers adorn a fresh hill. He beckons forth the fire to match the scene playing out in our lives. Truth prevails in His Story, and He pulls the truth right out of our hearts — the painful truth burning like a fire within us. As the winter dying is the unavoidable way to spring, our current mystery and pain will eventually join with now unseen paths. Meaning, understanding, clarity — they await our current trust, but maybe not until the other side of eternity. It might not be safe. And it will definitely not be boring. And on that run is our Master Guide, conquering the swift, the steep, the fear with us.